Musicians have it rough- simply practicing our instruments leads many to pain, either from the sheer volume of practicing, misalignment, or from overuse. But for others, simply carrying our instruments (and purses, man-bags, totes, etc.) can be painful, and can exarcerbate (or be a contributing cause in) shoulder, forearm, and back issues. Instruments in their cases can be anywhere from 7-30 + pounds, and many people carry them on one shoulder, or with one arm for periods of time which can result in serious damage over the long haul. First of all,a mini biomechanics lesson courtesy of Katy Bowman: your body is impacted by all of your movement choices (or lack thereof), which includes how you carry things, hold your instrument, walk, run, squat, sit, etc. The process in which the body inputs load/movement is called mechanotransduction. Now, factor in magnitude (how much something weights), location (where you carry it), duration, frequency, etc., and you can see why how you carry your violin case, bag, double case, and more impacts your body. Violin (and viola) cases by themselves weigh anywhere from 5-12 lbs, and with instruments in case, sheet music, and other accoutrements, can be solidly in the 10-20 lb category. In addition, many musicians carry their instrument on one shoulder, which causes that shoulder to elevate and contract to support the case. For example, let's say someone has injured their left forearm or shoulder, and always loads their right shoulder with their case. That long term load will contract the whole right side of the body to support it, which can encourage spin and pelvis misalignment, and put extra strain on the neck as well. The heavier the case, the more detrimental, especially if the straps gouge in your flesh, or if you're loaded down with other bags. So what can you do if you carry a double case, need to shoulder a heavy load of sheet music, or already have shoulder and back pain? Do I favor one shoulder over the other when carrying my case? Do I carry my case with one side more often than the other? Carrying on its own is not intrinsically bad-it's how you carry it that matters. If you carry your case (or a heavy purse) in hand frequently, switch sides as much as possible since that side is being pulled down by the weight of the case. If you use backpack straps,notice if one shoulder does more of the work than the other and that the straps are even lengths. 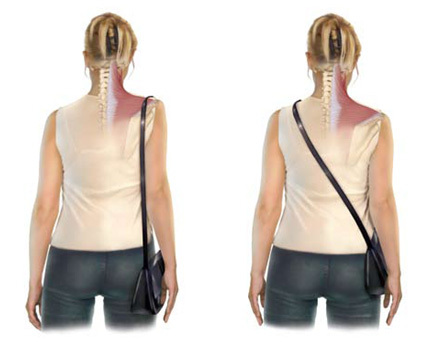 If you carry your case (or purse) on one shoulder, see how much you can vary that pattern to keep your soft tissues from being overworked on one side. Even if you don't have pain while shouldering your instrument, bags, etc., the more variety of movement you can create, the better balanced your upper body will be, and more pain-free you can be in the long-term. And don't sit on your wallet all day. Besides carrying a case or backpack centered on my back, it seems good to carry it on my right shoulder sometimes. There's always the tendency for strain to be on the left shoulder and neck when playing, so carrying bags on the right side seems like it would balance out the two sides(?) and put less strain on the left side. It depends which of two violin cases I am using. The smaller one (Hidersine) hasn't got enough room for unfolded sheet music but it has two convenient shoulder straps so that it can be carried as a rucksack. The larger, of unknown make, is a little lighter than the Hidersine but has enough room in the outer compartment for all the music I'd ever need for a rehearsal or concert, but it can't be carried as a rucksack. Most of the time my sheet music, a fold-up stand (if needed), and other items are carried in a capacious shoulder bag, so that I more or less equalize the total load between both sides of my body. My large case, when it contains the minimum of violin, one bow, rosin, tuning fork and a set of spare strings, weighs 2.5kg. Something I've always found interesting is that, in those few videos and photos we have of Heifetz carrying his violin case, he always seems to be holding by the handle rather than using the shoulder strap. I wonder whether perhaps he was aware (even intuitively) of the potential body-alignment problems you describe. He seems to have practiced excellent body-use in every other way, so that wouldn't be surprising! Arms are made for carrying. Shoulders aren't. Don't forget you can carry a violin IN a rucksack! or strapped to the carrier on your folding cycle; or standing out of a back pannier on your full-size bicycle. I got the "Joey" case carrier, its very secure and sturdy, and you can tuck a folding stand into it. Good for the bicycle or motor scooter.